You may also be familiar with the Taxi Magic app. It’s the taxi fleet’s answer to app-driven car service, but from multiple personal experiences, it seems as though their technology is outdated. I’ve actually gone outside a full 5-10 minutes before the taxi has actually arrived when the app told me that they were a mere 2-3 minutes away. I’ve also gotten pretty rude Yellow Cab drivers in response to my hailing a cab via this app. Uber, on the driver side, isn’t perfect. While I’ve had a couple good experiences with UberX, I’ve also stood outside Roger Room watching an Uber black car icon make 5 laps, 3 blocks away on the map on my Uber app, before canceling and ordering a Lyft (with an awesome, background-checked, fist-bumping civilian driver and neon lights flashing on his car’s interior floor). Yes, I know where the fancy Uber car is thanks to the app, but it doesn’t necessarily mean that he knows where he’s going or I’ll get picked up in a timely manner. I recently got approached by the better-than-Taxi-Magic start-up app, Flywheel. They expanded to Los Angeles last summer and just this week, expanded their fleet partnership from solely Bell Cab to Beverly Hills Cab Company and United Independent Taxi. This means that their fleet has toppled 1000 cabs around Los Angeles. If we are comparing apples to apples, the only comparable test across similar price points would be against UberX and the loser, Taxi Magic. Uber-non-X base fares are $8 for a black car, $15 for an SUV – without going anywhere. UberX’s is $2, and advertises they are 30% cheaper than a cab. Flywheel could prove advantageous to what is undoubtedly a smaller UberX fleet, meaning faster response times for Flywheel. It took 3 minutes for a Flywheel cab (the driver had his own Flywheel-provided Android) to get to my place and the same amount of time to get one on the way back from seeing Rza at LA Weekly’s Bedrocktoberfest. Probably indicative of their capabilities are the cancellation fees. If an Uber car is more than 5 minutes late, the cancellation fee of $5 is waived. If a Flywheel car is more than 3 minutes late, the cancellation fee of $6 is waived. That gives more credence to Flywheel’s competitiveness. And now, new users of the Flywheel app can use code “ESTARLA” for a free $20 credit towards cab rides. Unlike Taxi Magic, you can talk directly to the driver and the app has direct access to the entire Flywheel fleet rather than through a dispatcher. It’s also prettier and way less janky, with geo location pinpoints way more accurate. And like its competitors, you rate your driver and your driver rates you. If the cab driver cancels too much, he/she will be removed from the database. The perhaps most glaring difference is that Uber does have a fare calculator and Flywheel does not, as of yet. And of course, driver competence and friendliness across the platforms remains to be tested. But hey. 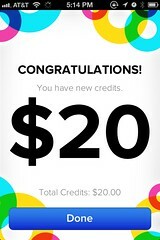 You now have free $20 credit, so you may as well give Flywheel cabs a try. New users use code “ESTARLA” for $20 credit. This entry was posted in Deals, L.A. and tagged 20%, @flywheelnow, @flywheel_la, Android, app, application, Bell Cab, Beverly Hills Cab, cab, code, download, estarla, Flywheel, free, iPhone, LA Weekly, Lyft, Sidecar, smartphone, taxi, Taxi Magic, Uber, United Independent Taxi. Bookmark the permalink.